application of Nemaslug® can provide up to 6 weeks protection. 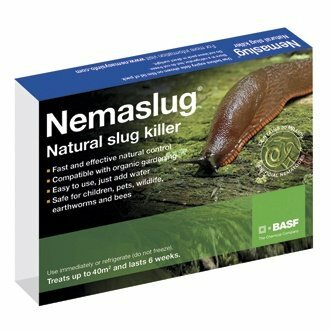 Unlike chemical pellets, the nematodes continue to work well during wet weather - exactly when you need protection against slugs. Start your control early and you will be able to target the young slugs growing under the ground before they do any damage. Slugs are generally active when plants start growing and soil temperature is over 5°C. Young slugs tend to stay underground, feeding on decaying organic matter, developing unseen and waiting for young seedlings to be planted. They breed all year round with two overlapping generations, peak egg laying is March – April and September – October. Nemaslug® uses nematodes (Phasmarhabditis hermaphrodita), naturally occurring microscopic living organisms already present in the soil. All our products are continually quality tested to ensure effectiveness. This pack fills 8 watering cans of 5 litres and treats up to 40m² (50sq yds). Packs are despatched at the optimum time for application and need to be used upon receipt, use the entire packet at one time and do not store made up solution. This is a live product so only despatched to UK addresses. This pack fills 20 watering cans of 5 litres and treats up to 100m2 (120sq yds). Treats up to 12m² or 210 (7.5L) pots. - Always use in accordance with instructions. - Upon receipt, use immediately or store in a refrigerator (do not freeze). - Do not use product beyond Use by Date. - Use the entire packet at one time, do not store stock solution. - For outdoor/glasshouse /polytunnel applications use when slugs are active and soil temperature is consistently above 5°C. - Avoid applications in bright sunlight. - Apply in the evening or in dull conditions. - Ideally apply during rainfall. - Soil or compost must be moist before and for at least 2 weeks after application. - One application will provide control for up to 6 weeks, for continued protection re-apply at this time. 1. Dissolve the entire contents of the pack in a bucket containing 4 litres of water to create a stock solution. 3. Apply the solution to an eighth of the soil area to be treated. Add entire contents of the pack to the bowl of the feeder. Fill the bowl with water, mix thoroughly until fully dispersed and attach the hose. With the feeder in an upright position, apply evenly to the whole of the area using a side-to-side motion. Application will take approximately 8 minutes under standard water pressure conditions. To make sure the nematodes are adequately watered in, treat the same area again for a further 8 minutes if treating a vegetable patch or 16 minutes if treating a lawn. Applications to lawns require more water to wash the nematodes through the grass thatch. To maintain the effectiveness of your slug control programme you should re-apply Nemaslug® at least every 6 weeks when the soil temperature is suitable. - Nematodes are naturally occurring microscopic worms, already present in the soil. 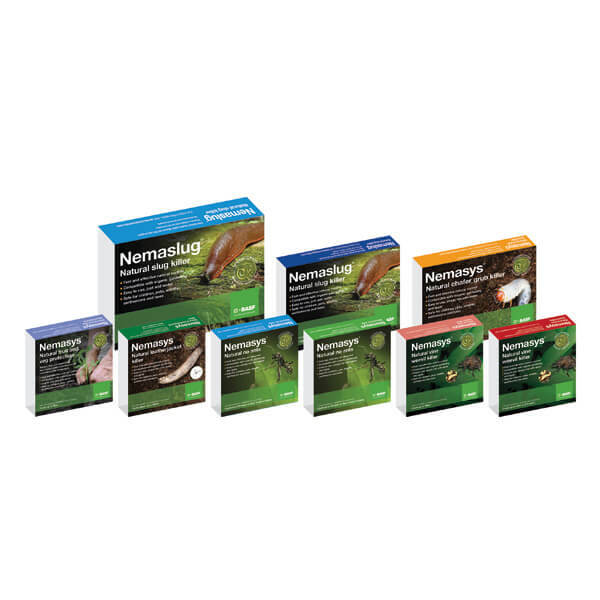 - Our specially selected nematodes attack the pest by entering natural body openings or by penetrating the insect cuticle directly. - Once inside, they release bacteria that stops the pest from feeding, quickly killing the pest. - They do not stop there. The nematodes reproduce inside the dead pest and release a new generation of hungry nematodes, which disperse to hunt down further prey. - When nematodes can no longer find prey they will die back to their original numbers.